Join us at the AAAdventure Camp 2018! EDIT (1/7/2018) – The Expression of Interest period is now closed. If you would like to stay up to date with future events and programs, we encourage you to register with AAAF. 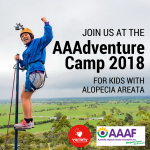 AAAF is now accepting expressions of interest for the Alopecia Areata Adventure Camp 2018. This weekend of adventure is free for kids with Alopecia Areata. This includes flights, meals, accommodation and activities.